Do You Need E-mail Marketing To Grow Your Personal Training Business? Do you need e-mail marketing to build and grow a successful personal training or fitness business? You might be using social media, and you might not be generating enough leads. As part of that, you may think that you’re missing a trick and you’ve maybe heard that e-mail marketing is a highly effective way to grow your income, build authority, and build a better business. A large part of you wants to know whether or not it’s going to be effective for you. So, here’s the thing. There are a number of things that you want from e-mail marketing. You obviously want to build authority and you want to make more sales. That’s the whole goal of marketing. It’s to create a business where it never existed before. But, is e-mail marketing really worth it? Is it one of the most important things that you need to get right when it comes to marketing your fitness business? The answer to that is no. For most people, it’s not a priority. There are a ton of other things that you need to have in place before you even look at e-mail marketing. So, let’s talk about those. First things first. You’ve got to establish your goal. What is your goal with e-mail marketing? Is it to build authority? Is it to gain more sales? If it is, like most people, there are a couple of things that you need to exhaust first. The first thing is your referrals. Have you got a solid referral system in place? That means asking your current clients if they know of anybody that would benefit from your services. Making sure that you’re asking that on a regular basis, especially if you need leads, is a great way to generate free customers that are already highly qualified because their friends and their family that have trained with you have already done a lot of the questions and answers in relation to the objections about price, about time, about difficulty. Referrals are a highly qualified form of traffic. Plus, they cost very little. Secondly, have you put a call to action on your organic social media content? How often do you ask your audience to work with you? Every now and again you should be putting a call to action on the end of a testimonial, on the end of a valuable post saying, “I’m looking for a certain number of people to work with me. If you’re interested in working with me, DM me.” If you’re not doing that, then people are going to assume that you’re either too busy or you’re not taking on clients. So, make sure that you’re doing that. Last but not least, Facebook adverts are a much more effective way to get in front of people. Let’s face it. When it comes to e-mail marketing, there are so many spam filters nowadays that it can sometimes be difficult to get inside an inbox. Just think about how many times have you even gone through your e-mails and looked at every single one. People like to skim, and when it comes to e-mail marketing, you need to be very good with copy, making sure that your subject lines are really, really tied in and grabbing attention. If you’re not good at copyrighting and writing isn’t a strong form of marketing for you, then it’s definitely not going to work the best. Using something like Facebook ads with a good quality image, infographic or video if you’re good on video is a much better way to get in front of people, especially when you put a payment behind it and you do paid Facebook advertising. As personal trainers, we spend a lot of money on websites and courses, but we don’t spend a lot of money on building our audience using paid advertising. 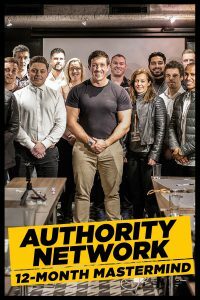 As part of Authority Network my 12-month Mastermind I teach the guys about building capital with their Facebook ads first. We build an audience, and we build an audience using highly relevant topics, value pieces, case studies on video and we build an audience, and then we remarket to that audience with specific offers. But, we don’t market to people cold. We use highly valuable videos and pictures first along with a good long copy, short copy, medium copy – it depends what the offer is – to build trust and let people know what we do and how we can benefit their lives. Then you can retarget the highest percentage of people that have viewed the whole length of your video or engaged most with the likes of your social media pages. That’s a far more effective way to get in front of qualified traffic and to present offers to them and making sure that your Facebook ads obviously lead to a sales page or a book-a-call page so that people can do business with you. That’s a far quicker way than using e-mail. Now, don’t get me wrong. I’m not saying that e-mail can’t be used, but once you’ve exhausted all those other areas and you’re actually implementing and using them and measuring the leads and conversions in sales that you’re getting, then look at considering e-mail marketing. At the end of the day, you don’t want to be doing unnecessary tasks and unnecessary marketing before the most important stuff. Secondly, you need a highly effective system in place to create e-mails. Wat day of the week are you going to write about certain subjects and topics? Are you going to write or are you going to transcribe it? These are very important things that need to be asked and put into place when it comes to maximizing e-mail marketing. There’s nothing worse than having sporadic e-mails from one week to the next and then no e-mails for three or four weeks and then e-mails again with no real goal behind them. One of the worst things you can do is just e-mail people always trying to sell. You need to build the relationship over time. So, you’ve got to be good at storytelling. You got to be good at delivering content, and you need a system in place to allow you to repurpose your current content that you have and also provide new content to really get into the hearts and minds of the people that you want to do business with. Last but not least, please make sure that you have got all those other factors in place. You’ve got referrals. You’ve got Facebook ads to a sales page or a book a call page. You’ve got call to actions that are regularly being put out on your organic social media feeds. Secondly, you’ve got a content production system in place, and you’re making sure that either you’re writing it or transcribing it, or you’ve got an editor that’s putting together your own content. You’ve got a day in the week to do it. All of this kind of stuff is really, really important before you even consider using e-mail marketing. I hope that helped. I hope it answers your question. Take care. This action packed webinar that will teach you how to attract dream clients, make more money and overcome self-doubt. Watch it here. If you currently earn under 10k per/month and feel a little lost with your business – click here. 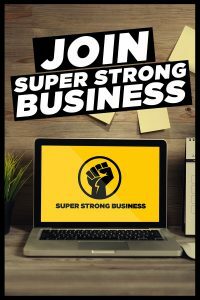 Join my 12-month Mastermind Authority Network and connect with other Fitness Entrepreneurs looking to grow their business. If you feel like you’re in relatively good control of your fitness business, but know you could be working smarter (not harder) and want to upgrade your peer group – click here. Every year I take on a select group of 6 figure entrepreneurs and help them scale beyond 6 figures. Extremely limited. If that’s you – click here. Ben & Steve generate 15k in 28-days after nearly closing their gym doors! Overworked PT Kyle goes from earning under £500 p/week to over £4k p/week in less than 6 months.